The Cheap and the Brave. No matter how much money you have in your bank account, there's always something in Magic you don't have. But that's okay. Because whether you have a storage locker of Magic cards or just a deck you bought at lunch, you can play Magic with as much fun, enjoyment, and value as the next person! Budget decks are every bit as useful as "unbudget" decks are. At the kitchen table, you can run cheap stuff that's every bit as powerful as the expensive junk. It's often more fun, too! Commander is a quirky format when it comes to Magic finance. Some powerhouses have leaped in price far beyond anything that tournament staples bring. Meanwhile, some cards are cheap, but their pimped-out, foil versions are sky-high. But most of the good, quality cards in Commander are literally at bulk prices. That's why I've pushed this budget Commander series. The goal is for each deck to clock in beneath the price of the previous deck, excluding basic lands. Over at CoolStuffInc.com, I've looked at the near-mint quality of card. You can often find cheaper versions. The budget of the previous deck was $34.94, as my Teneb deck cleaned the clock but not the wallet. I felt it was time to dip into another wedge-colored leader, and this time, let's hit up Temur's inspired guy who's all ready to beat all of your enemies at your next Magic night! This deck comes in at $34.83. Note that this exact price is obviously subject to change from when I wrote the article to its publication and then to when you read it. Prices may alter, but the basic concept remains. You can smash red zones and faces alike with all of the beat-stick-ing-ness of Surrak Dragonclaw. If you want a fun Commander deck that never takes itself too seriously—and is cheap on your wallet to boot—this is the guy to start with! Surrak brings three colors to the table with him. The first place I wanted to look was at the Naya 5-power-creature mechanic. I then wanted to combine that with the Temur 4-power-creature mechanic. After all, we have a ton of quality to mine with the obvious overlap. Finally, most of the big beats that I was considering were Beasts (literally and figuratively). So we can add in a ton of Beast lovin' in R/G from Onslaught block. The result is a big-critter deck that looks really fun. But what does blue add? One of the fun things that blue can add to a project like this is some level of tempo. Whether you are tapping down a blocker or bouncing it, you can help to create a path for your horde to exploit. While cards like Tamiyo, the Moon Sage and Ral Zarek are probably out of reach of this budget, we can certainly run some other stuff. That's the goal of the deck: to have a tempo/Temur/Naya/Beast/tribal budget deck that runs Surrak Dragonclaw and a lot of fun. And if that doesn't sound like a passel of fun, you must not have a single Timmy bone in your body! Now that I've explained the basic framework for our deck, how do I build it? Well, let's begin with the Beast enablers. Because of the heavy value of drafting in that block, we have a large number of really bad, Beast-friendly cards. Shaleskin Bruiser isn't making the cut in this deck. So what will? 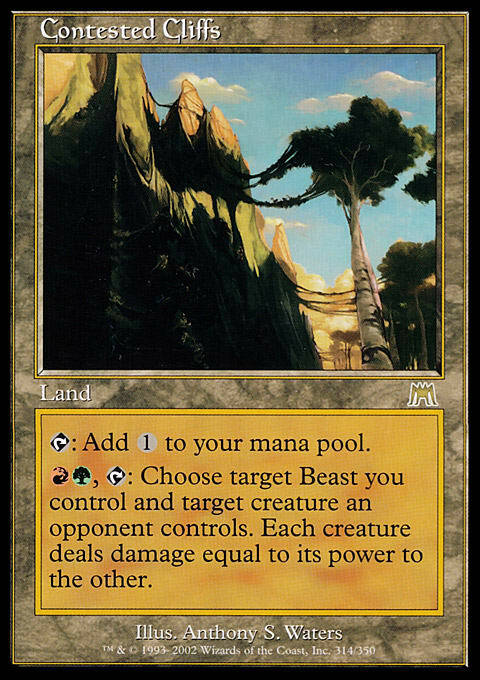 Contested Cliffs is a first choice that works well as a way to use your Beasts to kill their prey. Adding in little removal options like this can really flesh out a deck's flexibility. Meanwhile, the classic Ravenous Baloth was once iconic as this amazing 4/4 for 4 mana with an ability. It was one of multiple creatures in the era that were the beginning of the new age of creatures. Wirewood Savage draws you a card for your Beasts while Totem Speaker gains you life. Meanwhile, Aether Charge pushes this entering-of-the-battlefield theme that we have going! Take a look at Canopy Crawler and Krosan Warchief. The first is an awesome pumper for your deck as long as you have a hand of Beasts when you play it. 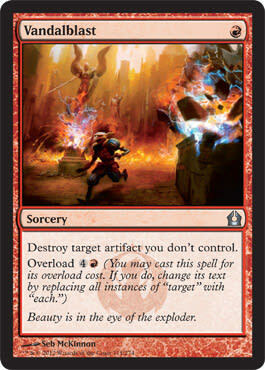 It dominated Onslaught block, by the way, when it was a commonly-played Constructed format. It's easily a 4/4 or 5/5 for 4 mana that taps to pump stuff by +2/+2 or +3/+3. Now add that to the Contested Cliffs or to cards that care about power. It's a very synergistic card. Meanwhile, Krosan Warchief can speed up your Beasts or regenerate them, as you need. Now, what about our Naya-centric, big-guy enablers? Well, since we don't run white, we can't play all of the fun Naya cards. But we have a lot to choose from in red and green. Consider Spellbreaker Behemoth and Spearbreaker Behemoth. While the Spellbreaker is a quick 5/5 for 4 mana with powerful anti-counter abilities (reminiscent of Surrak), the Spearbreaker can give them all indestructible with the press of a single mana. These are the sorts of Naya-based enablers this deck can really use. Beacon Behemoth can dole out vigilance to your beastly beating Beasts, and Mosstodon does the same with trample. Drumhunter can tap for mana and draw you cards when you have a big beater and/or Surrak. The Exuberant Firestoker also is a mana body wrapped in a fun ability that synergizes with the deck. Don't forget Paleoloth's ability to bring back dead beaters from your graveyard as you bring out more beaters. This deck just keeps on going! 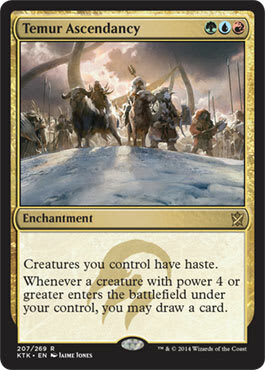 What about our Temur 4-plus-power stuff? Well, it's not in Khans of Tarkir, but Garruk's Packleader certainly fits the bill. Again, we have the card-draw added to our deck as big stuff begins to arrive on our side. Temur Ascendancy will draw you cards from your 4-plus-power stuff, too, while simultaneously giving everything haste. Then, I was able to force in a lot of actual proper Beasts. 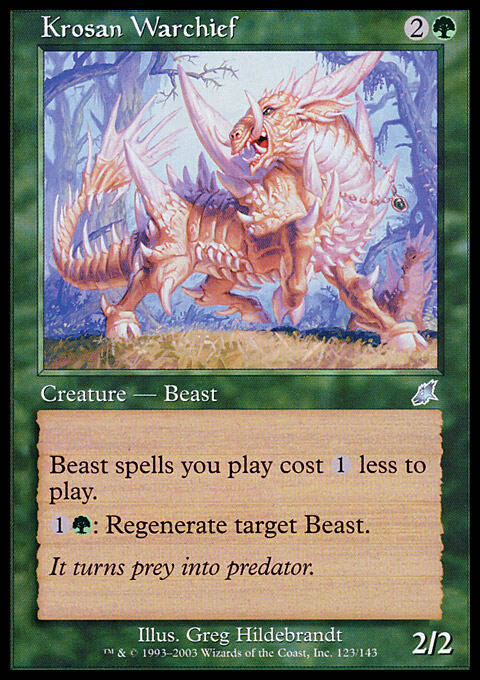 From Krosan Tusker's mana-fetching to Ravenous Baloth just churning out a lot more Beasts, we have a variety of Beasts. I also was able to include a lot of the great ones printed in Commander (2014 Edition). Take a look at Thunderfoot Baloth, Siege Behemoth, and Grave Sifter! All of those are cheap ways of extending the beats in appropriate directions. Don't forget to toss in pure beaters like Sagu Mauler. My final spate of creatures were those that added in useful abilities, such as Acidic Slime, Reclamation Sage, Flametongue Kavu, and Aether Adept. We can fetch big stuff with Fierce Empath or accelerate them with Quirion Elves and Farhaven Elf. After building a proper creature base, I looked for fun noncreature adjuncts to our theme. Sure, cards like Greater Good might be out of our budget, but Warstorm Surge certainly isn't. I liked the hasting of Temur Ascendancy so much that I included Fires of Yavimaya and Hammer of Purphoros as well. I also liked drawing more cards from our creatures, so both Coastal Piracy and Bident of Thassa made the cut. Don't forget that a cheap Mighty Emergence can pump all of your big stuff even bigger upon arrival. Without the ability to drop in a Sol Ring and such, I felt this deck needed even more mana rocks. So in went Everflowing Chalice and Darksteel Ingot, Temur Banner, and Dreamstone Hedron. Once it drops in price, you could add in Commander's Sphere. After that, it's just a handful of spells, and we are done! I linked up the expected removal, such as Vandalblast and Into the Core. We have a good number of counters for emergency usage, with Mystic Genesis a great piece of fun. Lost in the Mist is an underrated card because bouncing and countering is a powerful bit of tempo (as users of Cryptic Command have known for a long time). For more tempo fun, consider Capsize and Aetherize. But we also have the downright insane Cyclonic Rift. Ouch. Temur Charm can give you a Mana Leak, a fighting removal spell, or a bit of unblockability for an alpha strike. That's pretty flexible. So, what did you think of this deck? I think budget met Surrak quite nicely. And there are a ton of other directions you could consider. What about Beasts like Protean Hulk, Craterhoof Behemoth, Greater Gargadon, Thragtusk, Trygon Predator, and such? Mana-makers like Sylvan Caryatid, Manaweft Sliver, and Chromatic Lantern are interesting. 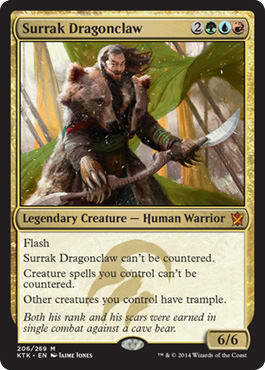 There are a lot of on-point Planeswalkers, such as a variety of Garruks, Domri Rade, or Kiora, the Crashing Wave. You could add in a lot more tempo, from Aether Gale or Arm with Aether to Man-o'-War. Momentous Fall. In the Web of War. Mizzium Mortars. Voidslime. Leyline of Anticipation. Crater's Claws. See the Unwritten. There're a lot of ways to look! So, get your budget on, in a Smashing Surrak Style! Let your inner Timmy out every once in a while! Brion Stoutarm came in at $37.71. Ghave, Guru of Spores, with a budget of $36.48, is a lot of fun! Talrand, Sky Summoner: $49.37. I increased the budget for it due to the nature of the challenge, and it’s the only entry in the series for which the cost is increased rather than decreased. Niv-Mizzet, Dracogenius is the next in the list, rocking that $36.37 price tag. Princess Lucrezia and Riven Turnbull feature in this fun, throwback, Commander deck that is just $35.68. Roon of the Hidden Realm demonstrates one of the Commander (2013 Edition) dorks in a $35.29 shell. Vhati il-Dal runs the table for just $35.17. With all of the expected draconic lovin’, Bladewing the Risen comes just a few cents fewer at $35.13. Lu Xun, Scholar General may not be a powerhouse, but there’s enough utility under here to spark a very interesting Commander deck for just $35.07. Bosh, Iron Golem was a fun, mono-red, artifact-centric deck that hits $35.06. That’s right: one cent cheaper! It’s a fun and different take on artifacts than good ol’ Brago. Brago, King Eternal is featured with a different artifact theme and a $35.04 budget. Let’s finally drop below that $35 mark with Lin Sivvi, Defiant Hero and her Rebel horde! It’s $34.98 for the witness. 13). Wedges are cool. 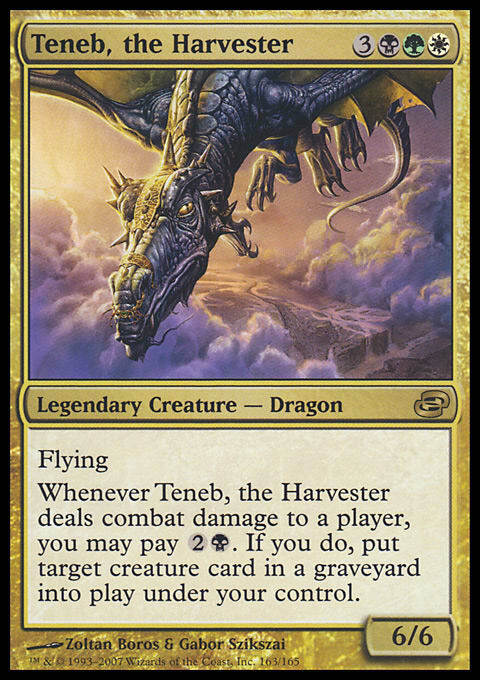 So is Teneb, the Harvester! $34.94 gets us a deck that wins and has fun.